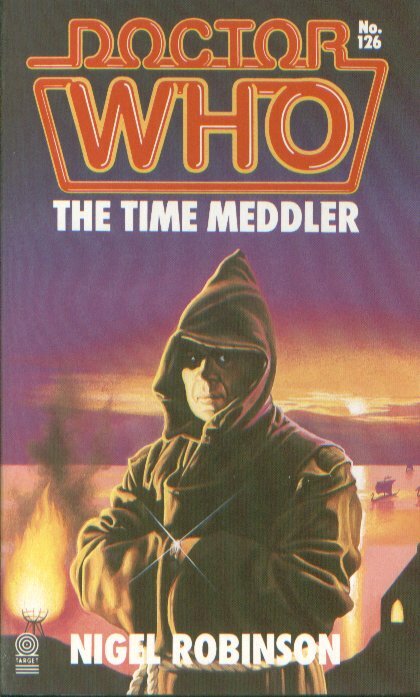 Running our fingers along decades of Doctor Who history, we pull free a slim paperback volume and aghast, hurl it to the ground; be gone accursed cover of the damned…and seriously is that supposed to be The Monk? Yes, its time once again to throw off good taste and enter the disappointing, confusing and bizarre world of the Target covers that spectacularly failed to hit the target. 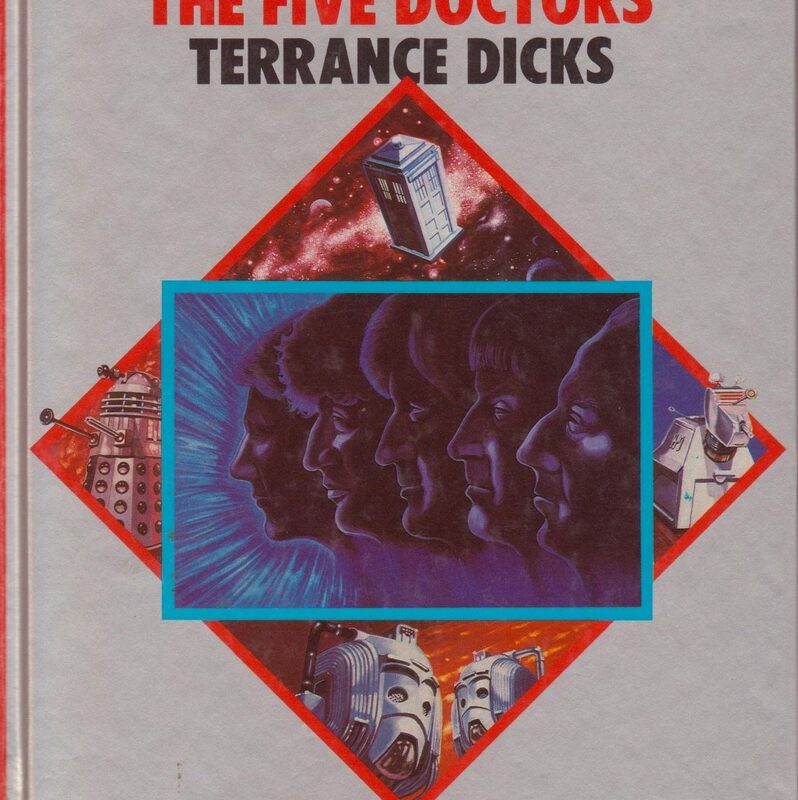 What do you mean, ‘how did this make the list?’ ‘Andrew Skilleter’s cover for The Five Doctors is brilliant, iconic,’ I hear you cry! And it is: evocative images of all five Doctors and the Master framed around a bold black monolith and an eerie Tomb of Rassilon. But that’s the Radio Times cover, silly. The Target one leans more towards bland than brilliant. For me, it’s so dull that it’s a bit like the Silence, every time I look away from it, I forget what it looks like. You’d think having five (ish) Doctors would be the major selling point (and Skilleter made that the feature with his RT artwork), so why are they all in a barely perceivable silhouette? Dark blue on black – that’ll stand out. As being a bit strange. Plus the choice to frame the picture a diamond means that you’ve lost half the space. 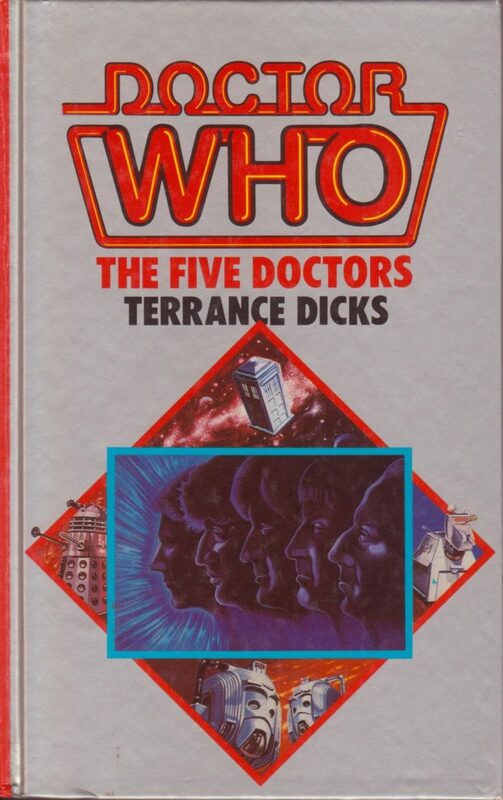 If you took the Doctor’s away (and who’d notice) and showed it to an unsuspecting Doctor Who fan (that’s all of us) who hadn’t seen the book but had seen The Five Doctors (stick with me) and asked them to name the story… Would they? Could they? Actually what they’d probably say is, ‘What cover? Sorry, I’ve no idea what you are talking about. Who are you? Leave me alone! I should kill you on sight!’ Run, Jamie! 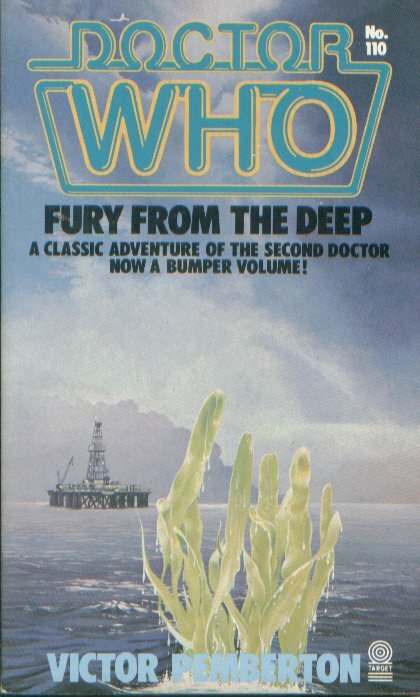 The missing story, Fury from the Deep is renowned as being one of the creepiest black and white Doctor Who adventures. We may never know how it would stand up today, but the surviving audio has a palpable sense of menace. Google tells me that ‘fury’ means ‘wild or violent anger’ and we can see that in the surviving footage of Mr Quill and Mr Oak, brrr. The director, Hugh David, employed all the visual and audio tricks at his disposal to bring menace to the main monster. Which is just as well because, although it’s a bit icky (as in I don’t want it wrapped around me when I’m having a dip) there’s nothing particularly frightening about seaweed. It’s just a plant that lives in the sea. Mummy! So, just showing seaweed rising up out of the ocean is unlikely to put the willies up anyone (and I don’t use that phrase lightly). Plus there’s that strange extra blurb under the title ‘A classic adventure of the Second Doctor now a bumper volume!’. Translated this means, ‘We’ve released a book and it’s slightly longer than the other books in the series, so it will take longer to read and you’ll have less pocket money left over’. Sold! 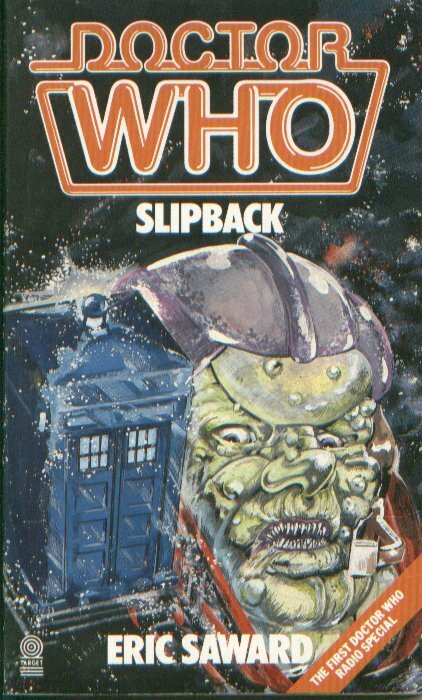 Actually, it’s the perfect cover for Slipback! Are you still asking what’s wrong? Honestly, you need to work on your obsessive pernickety fan disorder… are you even on the spectrum? Let me make this abundantly clear. Yes, it’s a monk. But it’s not The Monk. Because, he may be creepier and look more menacing. He may work out. But he’s not Peter Butterworth. Look at it. Look! Look PROPERLY. That is not Peter William Shorrocks Butterworth the English comedy actor and comedian, best known for his appearances in the Carry On series of films. Not. Him. It should be him but it isn’t. Burn it. Burn it. Burn the devil. Hey, it’s ‘The first adventure of the Seventh Doctor’. And to mark the occasion we’re going to make loads of the mistakes we made (some of which we corrected) on some of our earlier covers. A new Doctor, wow! What does he look like…? Sorry, you’ll have to wait seven months until Paradise Towers comes out. So, Sylvester’s following his two predecessors and doesn’t like illustrations of himself? No, um, he’s fine with that. So, you’re going with a photographic cover, but you’ll definitely choose a stunning shot that really represents the story, right? No, we’re showing these fluffy bat creatures. Is that a dramatic moment from the adventure? No, it’s kind of peripheral. 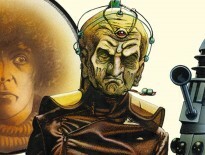 But you’ll definitely be featuring the Rani, right, she’s a returning character played by a popular, well-known actor? 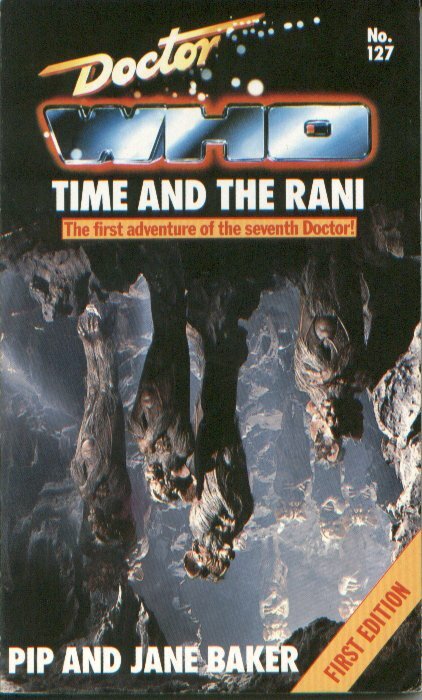 I mean it’s called Time and the Rani, why wouldn’t you…? No. No, we’re not putting the Rani on the cover. The designer insists on having the bat creatures, although he’s not sure which way up to put the photo. Sorry. Has anyone got Alastair Pearson’s number? Do you have any favourite hideous covers from the Target Years? Why don’t you sound off below, like a loon strolling down the High Street, shouting at pigeons? 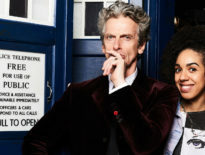 Features	#FollowFriday: Is Pearl Mackie on Twitter?